As I have been telling people this whole week, meteorology is just bunch of maybes. After one of the most epic busts in recent memory from the last storm, we look ahead to our next snow chance: Sunday the 19th. Yes, the best case scenario (if you want snow) would be a 15-20 incher with a full blown blizzard. I’d say the chance of this happening is fairly low at the moment. Right now we are looking at a 6-10 incher with less wind. One thing is for sure: WE WON”T GET RAIN!! The setup of this low pressure with blocking highs in Onterio prevents this thing from going inland. Like always we have TWO scenarios. The first takes the low up the coast as a nor-easter snowstorm giving us a good deal of snow. The second scenario sends the low out to sea, giving us a bright and sunny Sunday. There are many other possibilities for this storm. 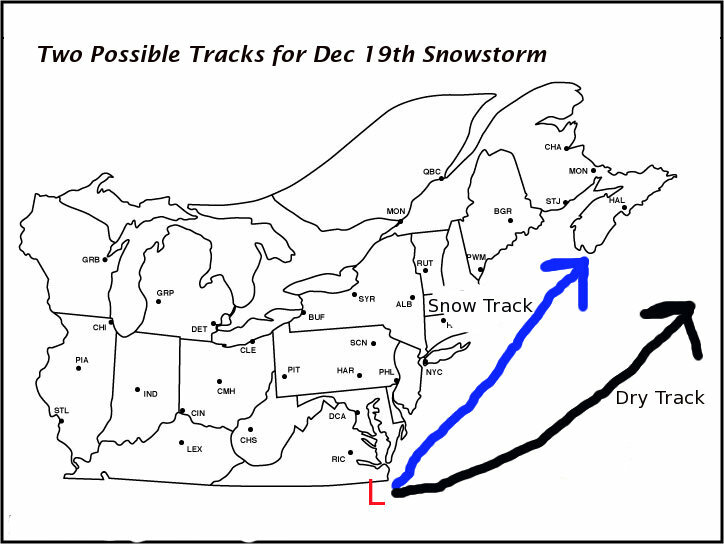 The image above I would call the best case scenario for a snowstorm. HELLO! i personally hope that it doesn’t snow.